From left to right: Nalle Descendant- Ms.Pauline Yancey. Tubman descendant- Ms.Leona Frederick. Dr Preston M. Royster (back row) made the presentation of these descendants. 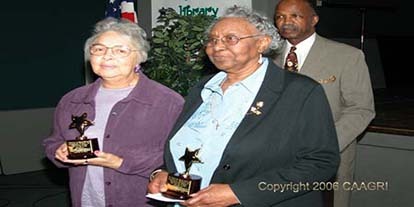 (Fredericksburg, Virginia) - On Saturday, February 25, 2006, in a crowded room of distant relatives, onlookers anxiously waited to see the historic meeting between the descendants of Harriet Tubman and the descendants of Charles Nalle, the fugitive slave whom she led to freedom on April 27th 1860. For the onlookers, the thrill was watching history unfold before their eyes. For the descendants, there was a sense of nervousness and pride. Finally, a gracious 'thank you' could be said to family of America's bravest hero- Harriet Tubman. This journey through time was not overshadowed in numbers and facts but the true essence of what genealogy researchers hope to achieve in all our works: making the family one, again. It was an emotional time for the descendants not just because they were finally seeing and touching the real hands of those who benefited from the courage of both Harriet and Charles but because at the end of the program, they discovered that they were in the midst of family members they had never known! The Washington, D.C. descendants had no idea that the Virginia descendants ever even existed. It didn't stop there though. The Tubman descendants who have lived in the same state for years, had only heard of each other but had never met until the program. And perhaps the greatest treasure of all is that a young woman from New York who has always heard she was a Tubman descendant, finally met both sides of Harriet's family: Ross and Tubman (from Harriet's first husband, John). The union commanded three standing ovations. Truly an historic event for the descendants, the community and history, CAAGRI is grateful to have been able to write these new pages in American history. A special tribute was made to ninety-eight year old Civil Rights attorney, Oliver W. Hill, Sr. and in his honor, four of the former Farmville, VA students affected by the landmark lawsuit Brown v. Board of Education were in attendance. These remarkable heroes of endurance should serve as a constant reminder to us all that everyone is a living legacy. If we put our Faith with Works, we can accomplish great things. Mr. Hill knew it then and so did these former students of Moton High School. The keynote speaker, Mr. Paul Lawrence Vann delivered an uplifting message to every age group in the audience. His motivational message: "Living on Higher Ground: Charting our Future by Remembering our Past." Mr. Vann is a leadership and diversity expert the author of the highly acclaimed book, Living on Higher Ground: How to live with passion, motivation and joy.